Hey guys, let me give you a quick background on me first. I'm Chris, 21 and currently deployed to Iraq...and I'm trying to use my time here to get a solid freeride rig built up on the cheap, $1,500 max to have waiting for me to assemble when I get back. I've been out of the scene a few years due to the whole Army thing, so I'm not up on anything past like 2005, so any help is appreciated. I'm an east coast rider and this will be my only ride so I need to get up the hills I want to bomb down. So far I think I might want to base the build off of either a Jamis Diablo 2.0 frame or a Versus Blitz. That's about as far as I've gotten due to the overload of new gear I know nothing about. So best bang for the buck forks, cranks, wheelsets, everything. I'm open to any and all ideas (including complete bikes that might fit the bill) so thanks in advance! Are you only interested in a brand new set up? perfect for what u want, but they only have a 15" so hopefully your not a big fellow. Not necessarily...I'd prefer to go new, but I wouldn't say no to good gear that hasn't been thrashed. I just want the most bike for the money. That 7point is a sick deal for sure and saves you the time of having to piece together the parts. I think gathering all of the parts yourself adds to the fun but being over seas might make that more difficult... not really sure. Welcome to the forum and where on the east coast you from? if you want to upgrade that, search for a Roco TST R, and a 66 RC2 ETA, and you have a bike that you can lock down to be basically a hardtail, great at climbing, and actually my current setup. You can get it to your door at about 1560ish shipped. That does look pretty tight, my last freeride was an Iron Horse SGS that I liked alot, I'll start doing some homework on the 7point's. Oh and I'm from Virginia but I am stationed at Ft. Bragg, NC and am 5'10" 175lbs. I don't mind taking my time piecing together a bike though...I won't be able to ride it 'til well into next year, I think it might actually be harder if I knew I had a complete rig sitting at home in a box getting dusty. Last edited by cwpeer; 08-07-2007 at 12:27 PM. You'll spend a lot more peicing a bike together. At least I have in the past. I'd go for an Ironhorse if I were you. True true, ebay can come up with some killer deals off season. I got my MINT CONDITION Session 77 for $900 that way. BTW, Thanks for your service! Another vote for buying a complete bike like the Coiler or the Iron Horse freeride bikes, they are a much better deal than piecing a bike together separately. I've had several IHs, and while their customer service can leave something to be desired, the bikes are a good deal for the money. Oh, and I have a Coiler that's turning out to be a killer ride (handles alot like my SGS Sport did, with all of the pluses and none of the minuses). On a different note, thank you for your service to our country. Last edited by carbuncle; 08-07-2007 at 09:28 PM. save money and buy this, not a bad deal. That Stinky is pretty sick...I'm surprised at how much support IH has here, I'm doing more research into the 7points and am liking what I see. Anyone ridden the new Jamis Diablos? I'd be interested to hear what you thought...I'll run a search too. jamis diablo is very, very nice. jensons got the frames for half nothing, and it comes with a Ti spring. First off Cwpeer, thanks for your service. IF your are up north by Tikrit, check out the berms that the Army made there in 2005. Sounds funny I know, but we had a in flight mechanic on the B2's who somehow got to travel with his Bighit, everywhere. He would just throw it on the plane, and shred 20ft berms outside Camp Spector. It was the first 360 I had ever seener, and it was in Iraq! Anyway,.. If I were you, I would bank the tax free money while you are there and get something nice when you get stateside. As for the Diablo, it is a sweet frame. But in my experience, as well as most others, building a bike from the frame up costs way more then getting a complete bike. Especially the Diablo, the rear spacing is 150mm (Azonic Outlaws work), the BB shell is 83mm (Saint 83mm Crankset) and the head tube is 1.5 (this took an endless amount of time to get the reducing cups to match an 1 1/8 headset). These are the three things that have cost the most in my Diablo build. So if you can get a complete bike it would be the best way, if you are on a budget. Good luck on your new bike. When you get back to VA come on up to NOVA and we will take you to a few of the local spots. hey sodak06, I'm not up there, I'm out in the wild west. Our optemp is so busy I get back from missions and just pass out...I'll have to see about going aviation to get some riding in. That's pretty sick about that dude though. Good points about the Diablo...and yeah, I'm investing everything I can for the duration. You guys have me drooling over that 7point3 though...I think it was alot easier choosing bikes when I started as a kid and poor, that helped to narrow it down! I will have to take you up on that offer to ride NOVA, I'm from the valley but I've never ridden any further north than like Winchester. The 7 Points are nice rides. I liked them when I was browsing for a new rig, should have picked one up, would have cost a lot less. I have never met a 7 Point rider that was not happy with the bike. We have a few "local" spots out here, but if you get a chance look up the Boneyard pictures on this site. It is an ongoing project for us, most pictures are posted by CameronZ. There is much more out there now that the pics do not show. You'll get the idea from the pics. We are working on a new line with some tables and a huge creek gap, but it is lots-o-dirt to move via three shovels, three guys and beer. Good luck over there bro! Look us up when you get back! Yukon...I'm drooling man, very tight! 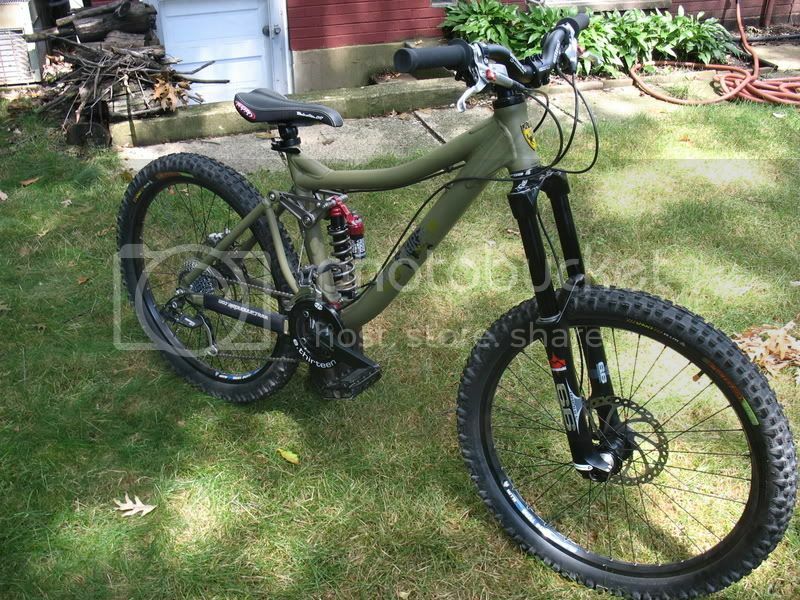 If you don't mind a bigger bike, I think the Specialized Big Hit is another great option. That being said, I used my Demo 9 as my do it all bike for a year until I picked up an Enduro. The Enduro would suit most of your needs too, but it may be out of the price range you are looking for.